Flu vaccines can help prevent us from getting or suffering the most severe effects of the flu. But, each vaccine only protects us from three different strains of the flu. If we don't have a vaccine against all types of flu, it leaves us open for an epidemic with a flu virus we didn't expect. After decades of research, the search for a universal flu vaccine that would offer protection against all strains has seen its first success. A clinical trial of a new vaccine strategy has been able to produce good immunity against several different strains of influenza viruses. Scientists from the National Institutes of Health (NIH), Frederick National Laboratory for Cancer Research, and the University of Melbourne in Australia studied the immune response to a different part of the flu virus than the one researchers currently use for seasonal flu vaccines. Instead of trying to generate immunity to particular types of flu virus, they were interested in a part of the virus that is often the same between different strains. The first tests in people have yielded encouraging results that this new strategy can produce good protection against multiple strains of flu. A research paper by first author Sarah F. Andrews from the Vaccine Research Center at the NIH describing the new flu vaccine strategy and testing was published July 14 in Science Immunology. Of the four types of flu viruses — A, B, C, and D — types A and B are most frequently responsible for pandemic (occurring worldwide) flu infections. Two proteins on the surface of the virus are used to subdivide further and classify the virus. Eighteen subtypes of hemagglutinin — grouped into two different "groups" — and 11 subtypes of neuraminidase can be combined to generate flu strains containing H1 through H18 and N1 through N11. For example, H1N1 was the cause of a worldwide pandemic in 2009 to 2010. Influenza B viruses are named by lineages and strains, instead of subtypes. Influenza B/Yamagata and B/Victoria are two lineages of Influenza B currently infecting people. A new flu vaccine is made each year based on patterns of circulating flu viruses and those most likely to cause widespread infections. They usually contain vaccines against three types of flu, but may contain vaccines against two type A flu viruses and two type B flu viruses. The vaccine prepared for the 2016-2017 season contained vaccines against H1N1, H3N2, and against influenza B/Victoria lineage. Once you get vaccinated against the flu, it takes about two weeks to develop antibodies to the viruses in the vaccine. The antibodies neutralize the virus if it later enters your body. Sometimes, the flu virus mutates, and the vaccine created against it does not generate antibodies effective against the mutated strain of the virus. This happened during the 2014-2015 flu season, when the H3N2 circulating was genetically different than the H3N2 strain the vaccine was created against. That vaccine was only effective at preventing about 23% of flu cases. To prevent potential pandemics from mutated strains of flu virus or from incorrect projections of strains that might circulate any particular year, scientists have looked for other ways to make a flu vaccine, preferably one that would be protective against all strains of the virus. 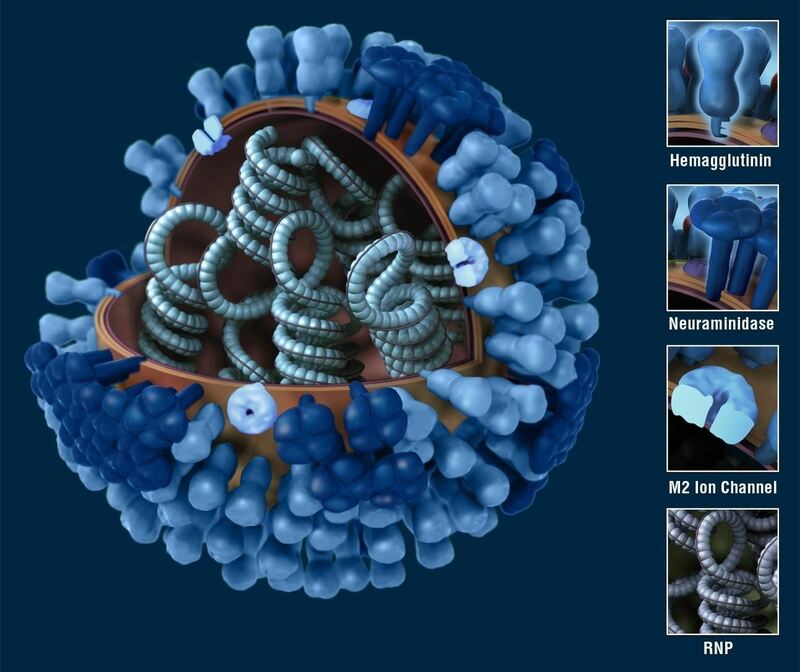 The major target of most antibodies against the flu is the hemagglutinin complex on the outside of its shell. The protein helps the virus bind to cells and clump red blood cells together, and can be slightly different from flu virus to flu virus. The proteins that define different subtypes of hemagglutinin are located in the "head" of the complex, but many different flu strains share the proteins in the "stem" area. Andrews and her colleagues thought that antibodies made to the proteins in the stem area of hemagglutinin might be just as effective, but less specific, than antibodies against one strain. The hope is that these less specific antibodies might neutralize many types of flu virus, and be universally useful in preventing infections. The research team looked at the antibodies from 40 healthy adults had been vaccinated against group 2 H7N9 or group 1 H5N1 flu strains. They found that B cells — the antibody producing cells — in people immunized with the group 2 H7N9 vaccine were broadly reactive to viral proteins in both group 1 and group 2 hemagglutinin subtypes. These results suggest that vaccines against the stem hemagglutinin proteins of group 2 viruses could be more effective at inducing widespread immunity than those against group 1 hemagglutinin stem proteins, or the current subtype specific vaccines. Work remains to be done to confirm whether an initial vaccination with group 1 or group 2 proteins is more effective for developing the most broadly-reactive antibodies. Those studies will include evaluation of vaccine in young children who haven't received the flu vaccine before and don't have pre-existing antibodies to confuse the results. The study authors also plan to continue evaluating their universal vaccine in larger numbers of people. If the current vaccine proves safe in phase 1 clinical trials, the next steps will be phase 2 and 3 clinical trials where the effectiveness of the vaccine will be determined and its side effects monitored. A universal flu vaccine holds the potential to eliminate the need for new seasonal flu vaccine development annually, to protect individuals against many different strains of flu, and to avert potential pandemics that can occur when flu viruses mutate after we've made vaccines against them. That's a tall order, but a universal flu vaccine could fill the bill.